Our time in Vancouver and then Chilliwack last week went by quickly. But I found time, one afternoon, while Ashley had class, to walk along the seawall at Stanley Park, from English Bay to Siwash Rock. I'd hoped to go further, but time was marching on, so I turned back. The sunny days dissolved into misty grey while we were there. Sea, sky, and shore blended into monochromatic vistas, save for the occasional pop of brilliant leaves. Tankers at anchor in the harbour await their turn to load or unload. They, too, melted into the landscape. Birds hung out on the rocks. In the bottom center photo, a cormorant spreads its wings to dry. I learned recently that cormorants have feathers with more "wet-ability" than other seabirds, to enable them to compress their feathers in order to be able to dive deeper for fish. Hence the wide-spread wing stance on the rocks. It would have been a chilly day for air-drying. Linking with Mary for Mosaic Monday, at the Little Red House. The play between foggy greys and bright fall colours has been mesmerizing this autumn, hasn't it?! Gorgeous images, Lorrie! You know, I feel so calm when I look at photos of fog. I guess it's the softness and the mood of losing yourself in its grey, vagueness. Thanks for sharing these tranquil images. The bright red leaves are the perfect contrast. We're having some cold weather here in NC this week but the sun is nice and bright this afternoon. Enjoy your day my friend! Love the pretty leaves and the beautiful scenery. Looks like a wonderful place to enjoy a walk and the views. Have a happy week! I love how those colours pop in the gray settings and I always enjoy learning a little more about birds. The first photo is especially beautiful. I'm so happy I get to visit Canada through you! That first photo is my favorite too. I'm glad you made it home at last. 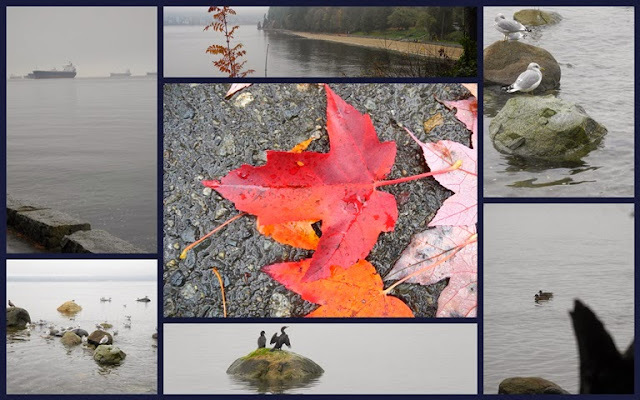 Beautiful pictures of gray days -- and I've always thought the colors of autumn look better on gray or rainy days! Maybe it's the color "pop." Glad you are safely home. I'm sure it feels good. I love these photos Lorrie. The mosaic is beautiful with the red maple leaves in the centre. I wish you a great week ahead. The grey sets off the spots of colour you found. I'm sure there's a metaphor there if I think about it a bit longer. That top photo is lovely. I always enjoy your walks. It's a bit early for winter grey, but the brilliant colored leaves stand out so well against it! Lovely mosaic, Lottie. those leafy reds make me want to buy some bright lipstick! Those photos look like November - brrr! Love the splash of colour on grey! One of these times when you are in Chilliwack we will have to meet up. Beautiful atmospheric images........ Autumn is lingering just a little longer! Your middle photo of the tankers in the bay is so beautifully framed. Interesting fact about Cormorants - great mosaic. Terrific not-sunshiny shots. Sometimes, they are better than 'perfect' weather shots. That one red leaf is just gorgeous. Truly beautiful examples of the lovely Pacific Northwest --- I do miss Fall there (but my bones don't miss the cold rain). Thanks for sharing and the memories. Hi there, looks like Autum's leaf colour is about to escape you, and so pretty the images shared! Simply beautiful, dear Lorrie! Even the GREY! Lovely and really wonderful images!